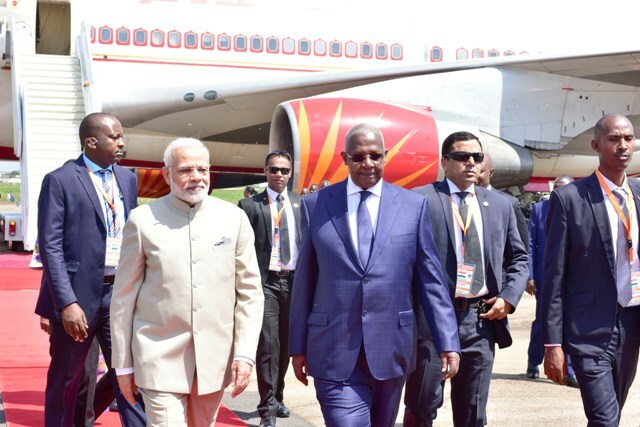 The plane carrying India Prime Minister Narendra Modi touched down at Entebbe International Airport on Tuesday afternoon ahead of his two-day State visit. Modi who is on a campaign to strengthen India’s ties with African countries has just concluded his visit in Rwanda. This visit comes three years after Mr. Modi convened the India-Africa summit, the third of its kind, in New Dehli to strengthen ties with African countries in 2015. After Uganda, he is expected to proceed to South Africa for the 10th Brazil, Russia, India, China and South Africa (BRICS) Summit. Mr. Modi was later received at State House, Entebbe by President Museveni for bilateral talks. The Minister of Foreign Affairs Sam Kutesa who received the Indian Premier at Entebbe says among other things, the Indian leader will discuss with President Museveni in areas regarding machinery, medicine and energy. It should be noted that this is the first state visit to Uganda by a sitting Indian Prime Minister after 21 years. 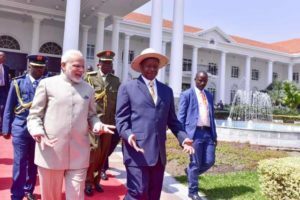 After bilateral talks with President Museveni at State House Entebbe, Mr. Modi will later today address and engage over 10,000 members of the Indian community at Kololo Independence ceremonial grounds. He will address a forum of the business community tomorrow. The prime minister also addressed the Parliament today at 10:00am and Flash Uganda media will bring you details soon.